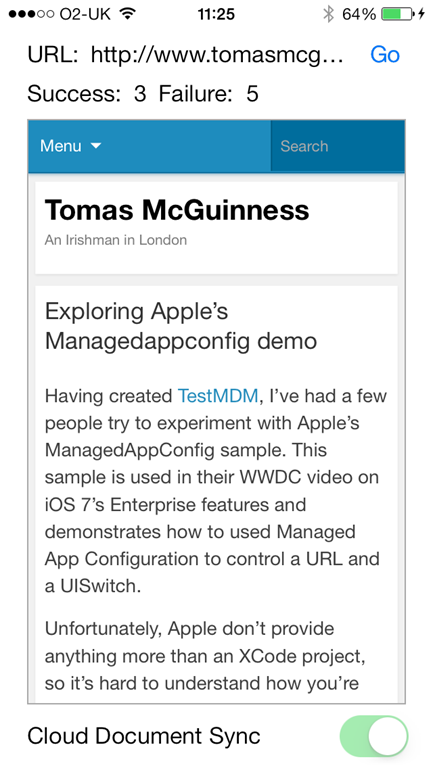 In part one of this two part series, I showed how you can use TestMDM to remotely install and configure Apple’s ManagedAppConfig sample app. In this part, I will demonstrate how you can retrieve feedback recorded by the app. 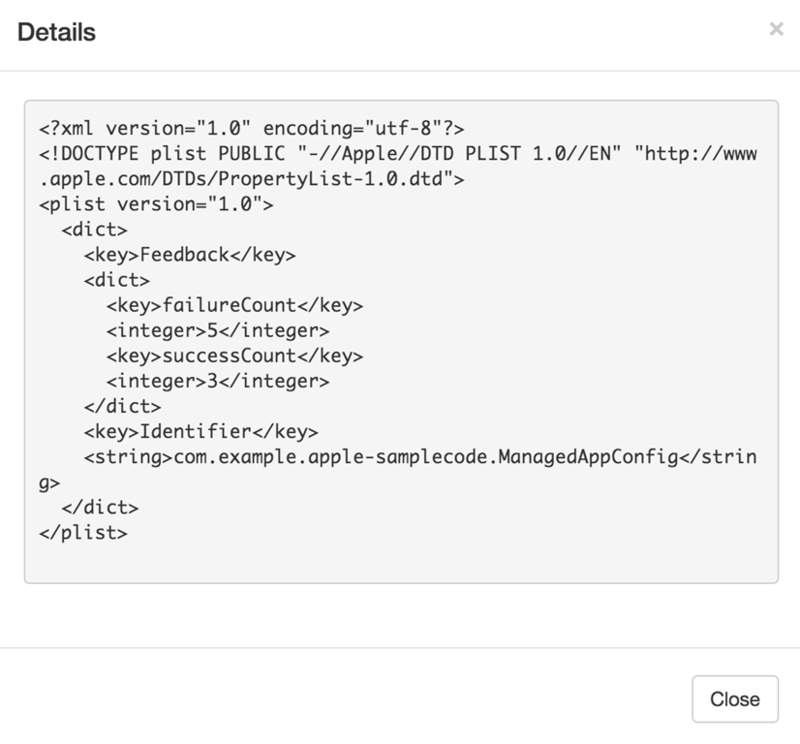 Apple allows an app to read managed configuration by opening the “com.apple.configuration.managed” key in NSUserDefaults. It also allows data to be stored in “com.apple.feedback.managed”. This data can be retrieved by an MDM at any time, allowing the app to effectively report back. 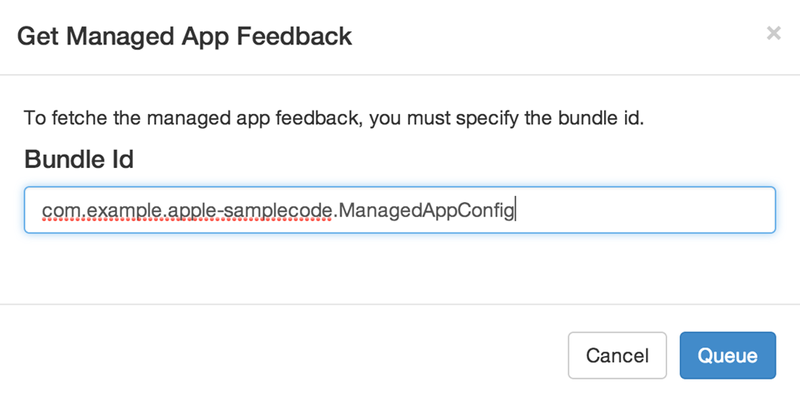 When you launched the ManagedAppConfig app, you will see two labels, Success and Failure, each with a count. The count is zero. If you hit the go button, you will see the failure count increase to 1. Go ahead and press it a few times. Now, using TestMDM, update the serverURL value to be a site you know exists. In my case, I’m using www.tomasmcguinness.com. Read part one to see how you update the configuration. Once the app has updated the URL value, hit Go another couple of times. The Success count should increase accordingly. 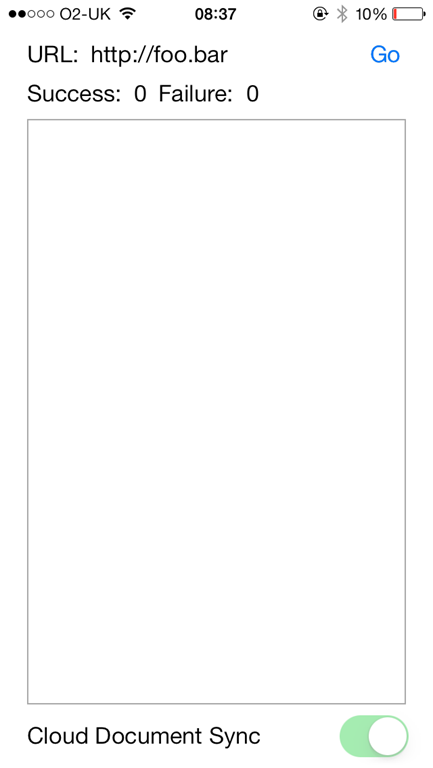 The app has, in the background, been recoding the values for Success and Failure in the “com.apple.feedback.managed” setting key. We now want to retrieve this data. 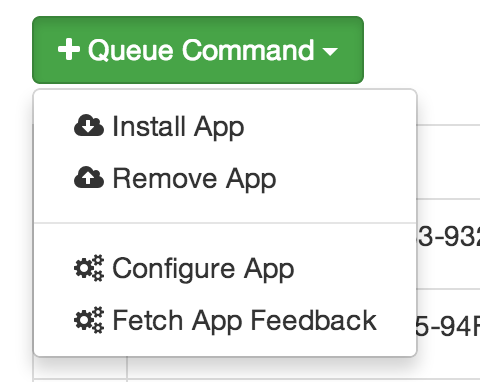 From the “Queue Command” menu in the Commands section of TestMDM, choose Fetch App Feedback. The Get Managed App Feedback (I need to change the name!) dialog will open. Enter “com.example.apple-samplecode.ManagedAppConfig” as the bundle identifier, assuming you haven’t changed it from the value in Apple’s code. The command will be queued. Once it has completed success, just click the Show Details option. Et Voila, you’ll see a PList formatted document containing two keys, which contains the values in the UI. If you are interested in testing your own Enterprise apps, you can sign up to TestMDM for free and get one hours free trial. If you have any questions or comments, please email me tomas@coldbear.co.uk or leave a comment below.